Does the accumulation of "space debris" in Earth's orbit pose a significant threat to humans, in space and on the ground? Viewpoint: No, evidence shows that no one has ever been killed by space debris, and satellites and space vessels have very rarely sustained serious damage from impacts in orbit. Just as an individual ship seems tiny compared to the immensity of the sea, or an airplane relative to the entirety of the sky, man-made satellites seem very insignificant in size compared to the vastness of space. The collection of material referred to as "space debris" ranges in size from tiny paint chips to huge space stations. But relative size alone does not necessarily determine the extent of the threat to humans posed by orbital debris. After decades of space exploration and in the face of an increasing presence of space-based technology, debate rages on about how to assess and manage the risks associated with space debris. Those who argue that space debris does not pose a significant threat to humans draw their confidence from the vastness of space itself, the ability of the atmosphere to burn up objects before they reach Earth's surface, and from ongoing efforts by engineers and scientists to minimize the proliferation of space debris and to protect against it. No one has been killed by space debris, and satellites and space vessels have very rarely sustained serious damage from impacts in orbit. Confidence that the good fortune of the past is likely to continue into the future, despite increased activity in space, is based in part on measures being taken by space agencies to improve their understanding and control of space debris. Those who fear that space debris poses an imminent threat argue that the uncertainty surrounding the dangers of space debris is reason enough to proceed with the greatest of caution. Rather than draw comfort from the absence of any catastrophic collisions during the first four decades of space exploration, they point to a collection of observations of minor to moderate impacts as a warning sign of potential disaster. Although serious damage has been avoided, space debris has fallen in and near populated areas, injured people, killed livestock, damaged terrestrial structures, and caused observable damage to satellites and space vehicles. Any increase in space-based technology could easily lead to an increase in such events, with an accompanying threat of more serious consequences. Perhaps the greatest worry associated with space debris comes from the possibility that highly toxic nuclear and chemical fuels used in space vehicles could re-enter Earth's atmosphere and contaminate a populated area. The biggest problem with "space debris," also referred to as orbital debris, is that no one knows for sure how to predict the risk they present. The official word is that the chances of human casualties as a result of orbiting or reentering debris are (currently) small. These statistics are arrived at using modeling techniques based on current trends and conditions, both on Earth and in space. The models are subject to change as trends change and knowledge expands. According to NASA itself, the growth in amount of debris poses a "rapidly increasing hazard." A close inspection of our space age to date reveals many close calls and potential catastrophes. Most of them were averted as a result of plain luck, rather than engineering virtues. The U.S. Space Command tracks more than 8,000 orbiting objects larger than 4 in (10 cm), of which only 7% are operational. The rest are debris—dead satellites, parts of exploded rockets, nuts, bolts, other lost hardware, etc. Most orbital debris is found in Low Earth Orbit (LEO), in altitudes below 1,243 mi (2,000 km). At these altitudes, objects collide at a speed of 6.2 mi per second (10 km/sec). In such velocities, even very small objects can inflict serious damage. It is estimated that smaller, non-tracked debris number in the millions. How much damage can an object smaller than 4 inches inflict in space? 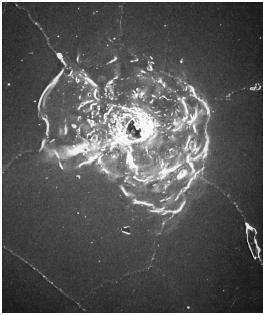 NASA documented a cracked space shuttle window from an impact with a paint chip estimated to be 0.008 in (0.2 mm) in diameter. Larger debris could cause damage up to and including a complete breakup of the spacecraft. And if a paint chip, which can't be tracked from the ground, cracked a space shuttle window, imagine what it would do to an astronaut out on a space walk. Space shuttle windows are replaced after many missions—the result of impact damage. The size of the debris is not the only factor in the risk to space missions and the personnel aboard. In a 1997 report, NASA scientists pointed out that a single component failure due to a collision with debris could have repercussions ranging from simply functional—limited to that component without affecting the mission or craft—to catastrophic. 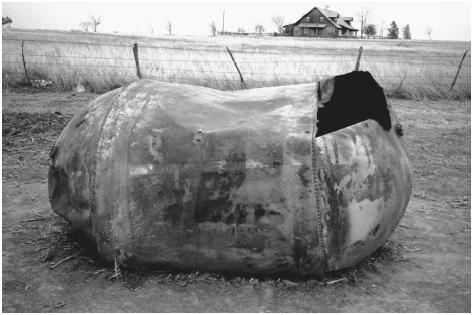 The hypothetical example cited in the report is a perforation of an air-tank stored outside the manned module of a space station. In a worst-case scenario, the perforation could cause a pressure change in the tank that is strong enough to thrust the space station to an altitude from which orbit can't be recovered, resulting in a catastrophic failure of the space station. It will be dragged into Earth's atmosphere, where it will break up. No doubt human lives will then be at significant risk, if not lost. With the amount and sizes of debris near the space station, this scenario is not far fetched. According to the NASA report, the chances of collision increase with the size of the object and the longer it stays in orbit. The International Space Station (ISS) is very large, and is meant to stay in space for at least 10 years. NASA, Lyndon B. Johnson Space Center. passed much further from the station than initially anticipated. A favorable miscalculation, but nevertheless it illuminates the unpredictability of space debris and our lack of reliable knowledge about them. Speaking to ABC News about the steering problem, James Van Laak, then deputy manager of space station operations, said, "This is just the first of many opportunities to be humble, and I hope that everyone will keep in mind that we're learning as fast as anybody." Can we afford this learning curve when astronauts are in the station, or in the shuttle? When people rely on machinery to protect them in space, or trust not to fall on them from the sky, we must also ask ourselves how reliable the machinery really is. Shuttles, space stations, rockets, and satellites are only as good as their human designers and engineers, who may underestimate existing dangers during design and review stages. When Thiokol engineers sought to redesign the space shuttle O-ring, for safety reasons, NASA cut off funding, saying that the current design was good enough. Then came the Challenger disaster, and seven lives were lost. The official inquiry report cited poor O-ring design as a contributing factor in that tragedy. Mother nature itself often foils even our best plans and protection measures. NASA's Skylab is a prime example. The hefty, expensive research facility was supposed to be refurbished by NASA after being boosted to a higher orbit. What no one at the time thought to consider was the increased activity of the Sun. The result of this increase was an expansion of our atmospheric region, which served to change Skylab's orbit. The orbit decayed rapidly, catching NASA unprepared. In the end, all that was left to try was to change the re-entry orbit so that it would hopefully pass over non-populated areas. These attempts failed. While many pieces of Skylab splashed into the ocean, plenty of pieces ended up on the ground, in Australia. In his book, Collision Earth! British astronomer Peter Grego recalls, "Ranchers in sparsely populated Western Australia found their estates strewn with hundreds of melted, twisted metallic fragments." The largest piece recovered was a 2.3-ton "fragment." One cow was reportedly killed by falling debris. Robert A. Frosch, who was NASA's administrator at the time Skylab crashed, was quoted as saying that he would rather look at chicken entrails than try to predict solar activity. Apparently he was right. On February 7, 1991, the Soviet space station Salyut 7 fell back to Earth as a result of increased solar activity. This time the people of Capitan Bermudez, Argentina, were the lucky ones, as once again debris littered a populated area. Attempts to change the reentry path were, once again, unsuccessful. Risks posed by orbital debris to people on the ground aren't limited to the heavy, twisted chunks of metal that fail to burn on reentry and fall from the sky. What very few people consider are the substances carried inside the various spacecrafts and rockets. Many times, these substances fall back to Earth. On January 24, 1978, after suffering a technical malfunction onboard, the Soviet satellite Cosmos 954 disintegrated over the Northern Territories in Canada. Scattered across a vast area were thousands of radioactive particles, pieces of the satellite's nuclear power core that survived reentry. The Soviets were unable to predict where Cosmos 954 might fall—they estimated somewhere between Hawaii and Africa; nor were they able to alter the satellite's flight path on reentry. Over 60 nuclear devices were launched into orbit so far. NASA will launch three more missions involving nuclear-powered crafts in the coming years. The army isn't saying much, but nuclear militarization of space is a known trend and an ongoing debate. What happens if a nuclear space rocket is hit by space debris? Nine nuclear spacecrafts have fallen back to Earth, so far. The Cosmos 954 incident was the worst one, and in fairness, some cores were never breached. But of the nuclear-powered spacecraft that fell to Earth, some released measurable radioactivity into the atmosphere. How do we know what effect the release of radioactivity into our atmosphere had on our health? Can we be sure that the next nuclear-powered craft that falls to Earth will once again miss a populated area, and that its core won't be breached? Nuclear material falling from orbit is not the only hazardous substance humans are exposed to when space debris falls to Earth. The village of Ploskoye, in Siberia, is directly under the flight path of Russian launch vehicles, and has been so for 40 years. When the first stage of the rockets separates, a large amount of unused rocket fuel explodes and rains down on the village. The fuel used in some of these rockets contains a substance known to cause liver and blood problems. The fuel coats crops and contaminates the water supply. Ploskoye and its neighbors report cancer rates 15 times higher than the national average. There is also an extremely high rate of birth defects in the area. The village doctor reports a spate of new patients after each launch, and schoolteachers report that children complain of various ailments in the days following launches. In the past five years, there hasn't been a healthy newborn in the village. The traditional space debris—fragments from the rockets—has killed cattle in the area. More often than not, accurate predictions cannot be made about landing sites of falling debris, unless the reentry is controlled from the ground. When the Russian Mars probe (another nuclear-power craft) fell to Earth in 1996, the U.S. Space Command targeted Australia in its predictions of the probe's landing site. The probe disintegrated over South America. Nor can we currently predict how much of a spacecraft will survive reentry. Intentional de-orbiting of some dead satellites, with the expectation that they will burn up on reentry, showed otherwise. 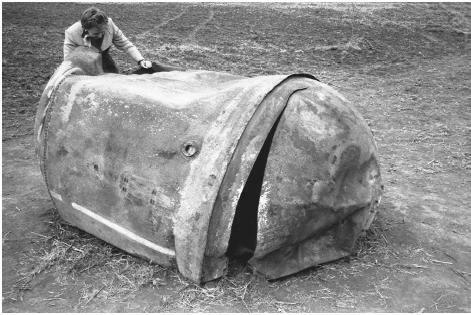 According to the Center for Orbital and Reentry Debris Studies, "recent evidence shows that some portions…sometimes significant pieces, may survive reentry and pose a hazard to people and property on the ground." Some significant reentry events include a second stage of a Delta rocket that rained debris on Oklahoma and Texas on January 22, 1997. One woman was struck by a small piece of debris. Another Delta second stage reentered in early spring, 2000. Debris was found in a farm in South Africa. When considering the risk posed by orbital debris, one must look not only at the current state of debris environment in space, but also into future conditions in the same environment. In a report issued in 1999, the UN Committee on the Peaceful Uses of Outer Space found that the probability of collisions between operational spacecrafts (including satellites) or between spacecraft and existing debris is increasing. To date, there is only one known case of a collision between cataloged man-made objects. In 1996, a fragment of an exploded Ariane upper stage rocket damaged the French satellite CERISE. As the report points out, the cause of many spacecraft break-ups in orbit is unknown, and might be the result of collision with orbiting debris. It is impossible to tell if the CERISE collision is truly a unique unfortunate event, or only the tip of the iceberg. The continuing launches of spacecraft compounds the existing problem. More objects in orbit mean a greater chance of collision. These collisions, in turn, will generate more fragments. The end result, if significant remedial measures are not implemented, will be an exponential increase in both the number of orbital debris and the number of resulting collisions. These resulting collisions, according to NASA, will be more and more likely to happen between larger objects, compounding the problem. Small satellites are important communication and research tools. Current planning will increase their number in LEO significantly. These satellites sometimes weigh only ounces and measure less than 1 in (2 cm). According to a recent analysis, small satellites will create constellations in orbit that are equivalent to debris clouds. Debris clouds are swarms of debris, clustered together, that are left in orbit after a break-up or explosion of space junk. They pose increased risk to operational spacecraft because they occupy a larger area than single pieces of "space junk." Owing to their design, small satellites have no collision avoidance mechanisms, they are difficult to track, and they have no means of what NASA terms "self disposal"—the ability to boost the satellite to a higher orbit or dispose of it through controlled reentry into Earth's atmosphere. In addition, these satellites are much denser than today's conventional satellite. Their higher density ensures they will stay in LEO for a very long time, but their operational lifes-pan is actually short. Thus they will be replenished at regular intervals, unlike true debris clouds that eventually disperse. What we are faced with, then, is a possible trend of increasing, hard-to-track "debris clouds" that will be replenished at regular intervals and fly blind. This situation will increase the risk to safe space flight operations. Many of these satellites are privately owned and operated, which makes them harder to regulate. In less than half a century of space operations, we've left quite a legacy: dead cattle, contaminated environment on Earth and in space, birth defects. As more attention is paid to the issue of orbital debris, more steps are being taken to mitigate the problem. This trend should be encouraged and enforced. Currently, the hazards of orbital debris are very real. To deny that a danger exists simply because we've been lucky so far is foolhardy. Most of us remember the children's story about Chicken Little who ran around shouting, "The sky is falling! The sky is falling." In truth, Chicken Little had mistaken a simple acorn to be a sign of impending catastrophe. Much like this fictional character, doomsayers would argue that the sky is actually falling and that space debris threatens to destroy life as we know it both on Earth and in space. However, experts disagree and evidence indicates that the accumulation of space debris is not as significant a hazard as some people would have us believe. At first, the very concept of space debris appears to be a tremendous risk, especially for those traveling in space. The speed of orbital debris, the term sometimes used by NASA for space debris, can be approximately 6.2 mi/second (10 km/second). At that velocity, you could drive across the United States, coast-to-coast, in about seven and a half minutes. Even something as small as a fleck of paint moving at that rate of speed could cause damage to something in its path. Then couple that knowledge with photographs that show clusters of space debris floating around Earth and it isn't hard to understand why some people might believe that a significant threat exists. However, this risk has been overstated and sometimes even exaggerated. History has shown that even with the copious amount of space debris circling Earth, it has had very little effect on space exploration, and even less on the planet below. The reasons behind this are many, but include the vastness of Earth and space, protective measures, and early detection systems. Together these factors have reduced the possible risk dramatically. Most space debris that falls to Earth comes from Low Earth Orbit, which is generally considered from 90 to 600 mi (144 to 960 km) from Earth's surface. The team at NASA has, however, expanded that range to include an area approximately 1,250 mi (2,000 km) from Earth's surface. How long it takes to fall can range from a few years to over a century depending on its height. Upon reentry into Earth's atmosphere, the majority of this debris is incinerated. Anything that does survive the trip down typically lands in an unpopulated stretch of the planet such as a desert or ocean. NASA's Space Science Branch at the Johnson Space Center believes that approximately one cataloged piece of debris has fallen to Earth every day for the last 40 years. Thus far, no serious injuries or property damage have occurred as a result of this falling debris. Thanks to the atmosphere and the sheer size of Earth's land mass, the risk that falling space debris poses to anyone is extremely small. "Space is big. To give you an idea of how big it is, let's go on a space trip from the Earth and travel toward the Sun. Let's drive day and night at 100 miles an hour and not take a pit stop. It'll take us 100 years driving day and night at 100 miles an hour to get to the Sun. After 29 years we would cross Venus' orbit, and after 65 years we would cross Mercury's orbit." as vast as space, the risk of severe collisions is minimal. Even when an object in space is hit by space debris, the damage is typically negligible even considering the high rate of speed at which the debris travels. Thanks to precautions such as debris shielding, the damage caused by space debris has been kept to a minimum. Before it was brought back to Earth via remote control, the MIR space station received numerous impacts from space debris. None of this minor damage presented any significant problems to the operation of the station or its various missions. The International Space Station (ISS) is designed to withstand direct hits from space debris as large as 0.4 in (1 cm) in size. Most scientists believe that the number of satellites actually destroyed or severely damaged by space debris is extremely low. The Russian Kosmos 1275 is possibly one of these rare instances. The chance of the Hubble Space Telescope suffering the same fate as the Russian satellite is approximately 1% according to Phillis Engelbert and Diane L. Dupuis, authors of The Handy Space Answer Book . Considering the number of satellites and other man-made objects launched into space in the last 40 years, the serious risk posed to satellites is astronomically low. In fact, monitoring systems such as the Space Surveillance Network (SSN) maintain constant track of space debris and Near Earth Orbits. Thanks to ground-based radar and computer extrapolation, this provides an early warning system to determine if even the possibility of a collision with space debris is imminent. With this information, the Space Shuttle can easily maneuver out of the way. The Space Science Branch at the Johnson Space Center predicts the chance of such a collision occurring to be about 1 in 100,000, which is certainly not a significant enough risk to cause panic. Soon the ISS will also have the capability to maneuver in this way as well. that reflect the way a debris field behaves. One of the most intricate models is called EVOLVE. It tracks the progression of a space debris field, indicating how certain factors can influence it. In this manner, future complications caused by launches or accidental explosions can be predicted and/or avoided. After all, the ability to anticipate a problem and prepare for it is a large part of the equation when we evaluate risk significance. In addition, space agencies around the world have taken steps to reduce space clutter. The United States, for example, has taken an official stand that is outlined in the 1996 National Space Policy that clearly states: "The United States will seek to minimize the creation of new orbital debris." For example, space mechanics are far more careful with regard to their tools. In the past, space mechanics sometimes let go of their tools and were unable to recover them. Strident efforts are now made to retain all objects used to repair satellites and conduct other missions. The Russians have also agreed to do their part. They used to purposely destroy their equipment in space to prevent it from falling into the wrong hands, but now refrain from that practice. Newly designed crafts and operating procedures also play a part in helping to keep space clean, while researchers continue to investigate safe ways to clean up the debris that currently exists. Everything from forcing the debris to reenter the atmosphere in a controlled manner to nudging it away from the Earth's orbit has been discussed. An activity such as collecting garbage from inside the space station and sending it back to Earth to burn up at reentry is one tangible way space explorers are helping to ensure the reduction of space clutter. At this time there is no international treaty on how to deal with space debris; however, several nations have joined together to form the Inter-Agency Space Debris Coordination Committee (IADC). The IADC assesses the subject of space debris and how it should be handled in the future. Japan, like the United States, has developed a list of safety policies regarding space debris. Because this is ultimately a global issue, other countries such as France, The Netherlands, and Germany have jumped on the bandwagon with regard to addressing this issue. Despite all the public discussion regarding space debris, some people fear that significant danger is being hidden from them so that space exploration can continue without interruption. However, there is no evidence that supports this theory. In fact, this theory doesn't make much sense in principle. Nonetheless, rumors concerning space debris as well as earth-shattering asteroids continue to circulate and are sometimes fueled by the media. However, perhaps Stephen P. Maran, recipient of the NASA Medal of Exceptional Achievement, puts it best. In his book entitled Astronomy for Dummies he says, "Conspiracy theorists think that if astronomers did know about a doomsday asteroid, we wouldn't tell. But let's face it, if I knew the world was in danger, I would be settling my affairs and heading for the South Sea, not writing this book." After all, in a world inundated with health warnings and cautions, it is no wonder that people are becoming overly cautious about everything. It's getting more difficult to determine what is media hype and what things should really concern us. Many people have become either desensitized to the barrage of cautions or they have become needlessly worried. In truth, science should embrace logic and balance. Naturally, some things really do pose a significant and imminent threat to our health and lives, but we need to keep it all in perspective. Most of us stand a better chance of getting hit by lightning than we do of getting hit by space debris. So, what about the risk the astronauts face in space? While it is true that they face a greater risk of getting hit by space debris than we do on Earth, Dr. Susan Holtz puts it best when she says, "They're sitting on liquid fuel and then torching it so that the rocket will shoot into space. It is my opinion that this poses a greater risk to their well-being than space debris." In short, in the grand scheme of things, there's a lot more to worry about. Therefore, when analyzing the significance of the risk posed by the accumulation of space debris, it is important to focus on the big picture. Consider all that is being done to understand and correct the problem and keep in mind that the accumulation of space debris has not posed a significant threat thus far. Of course, to dismiss the problem of space debris altogether is certainly irresponsible, but there's no need to be a modern-day Chicken Little either. We are not in immediate danger and to be fearful that something is going to fall from the sky and kill us is overreacting to the problem. Center for Orbital and Reentry Debris Studies. <http://www.aero.org/cords/index.html> . Chiles, James R. "Casting a High-tech Net forSpace Trash." [Abstract]. Smithsonian Magazine. 1999. <http://www.smithsonianmag.si.edu/smithsonian/issues99/trash.html> . Dunn, Marcia. "Astronauts Boost Space Station, Take Out Trash." Nandotimes. 2001. <http://archive.nandotims.com> . Engelbert, Phillis, and Diane L. Dupuis. The Handy Space Answer Book. Detroit, MI: Visible Ink Press, 1998. Maran, Stephen P. Astronomy for Dummies. Foster City, CA: IDG Books Worldwide, Inc., 1999. NASA's Orbital Debris Web site. <http://www.orbitaldebris.jsc.nasa.gov/orbital_debris.html> . The Orbital Debris Research Project. <http://sn-callisto.jsc.nasa.gov> . The Star Child Team. "What Is Space Trash?"2001. <http://starchild.gsfc.nasa.gov/StarChild/shadow/questions/question22.html> . Wilson, Jim. "Killer Garbage in Space." Popular Mechanics. 2001. <http://popularmechanics.com/popmech/sci/9608STSPM.html> . A lightweight protection that prevents damage to space crafts in orbit from hypervelocity impact. A circular orbit from about 90 to 600 mi (144 to 960 km) above Earth. Asteroids that come close toEarth's orbit. NASA defines it as any man-made object in orbit around Earth that no longer serves a useful purpose. The curve that an object describes in space. The rate of motion of an object, distance per unit time, in a given direction. This is AMAZING! It is well written and it gave me all the information I needed, Thank you.